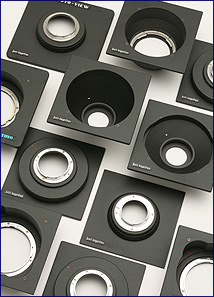 A shift of 35mm (about one image lenght) has the same perspectival effect as a 12cm shift in 4x5 inch format. The consistent and patented architecture of just-together adapters ensures that this broad range of possible optical adjustments is available without vignetting. Furthermore, one of the great advantages of the just together concept is the huge range of possible adjustments of professional view-cameras themselfs. Thus technical limits, which can be found in most of the other tilt-shift products, do not dictate the extent of parallel translations, but rather you, the photographer. In practice this gives you creative freedom, better photos and you'll save time because you can skip a lot of tedious post processing.